A-Q has enjoyed a decent outing so far in 2015, with the release of Son Of John II and also an all Hip Hop concert. He returns with a new single titled “King Slayer” produced by Beatsbyjayy. Banjo Oladapo Abisola popularly known with the stage name ABISOLA never cease to raise the hope of the street hustlers. The jericho crooner storms the airways with another monster hit titled OLOWO LAYEMO( a street anthem) ,produced by the multi-talented award wining Hitmaker D’tunes. Festina Izevbizua born in Benin, Benin Kingdom Edo State, of Nigeria. I attended Obagie primary school and St Maria Goretti secondary school in Benin before I moved to Europe. I have always wanted to become a reknown movie star all my life. This dream had been with me ever since I was seven years old. I was inspired by Genevive, Omotola and Sam Loko EFE *original name# who by then supervised several shooting rehersals behind my father's house. Due to many challenges in life I decided to make my very own first movie, to tell a part of my story. 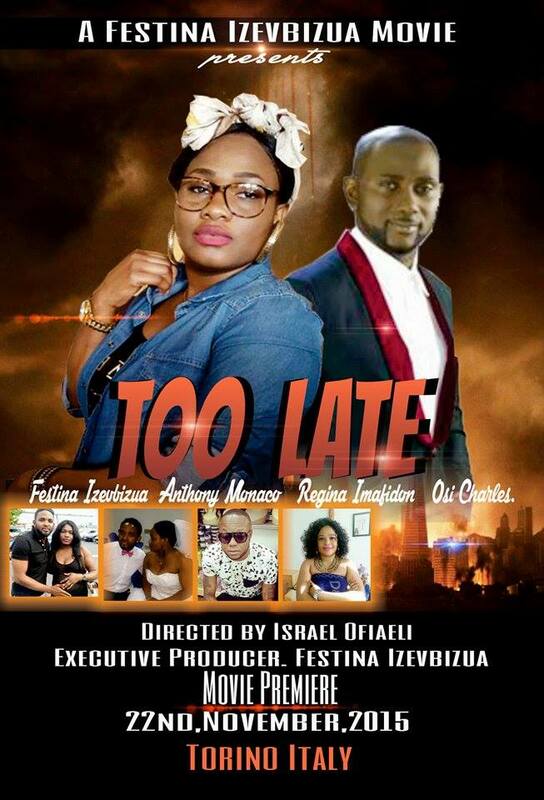 On this movie titled " Too Late" which will be premiered in Italy in November I played the lead role alongside Anthony Monjaro. This movie featured Anthony Monjaro, la cream boyz and other actors/actresses in Europe who had shared the same experiences at one point in Life. buster movie as we take down the lane. Kim Kardashian is one hot mama-to-be. The reality star has taken maternity dressing to a whole new level and now nearly six months pregnant- she’s not planning on toning it down anytime soon. Kim – who was wearing her new favourite style of long coat – recently opened up about how she would be dressing during this pregnancy after she came under fire while pregnant with North. The Keeping Up With The Kardashian’s beauty wrote on her website: “Everyone used to say Kourtney had the best pregnancy style, so I would borrow a dress she wore when she was pregnant, and OMG it did not look the same! Talking about this time round, Kim – who will be having a son in December – said: “I didn’t even know my signature style yet, let alone how to dress for a baby bump! “This time around, I know what I like — plus, I am confident and not trying to hide my bump. I actually want to accentuate it,” she continued. Joe EL hits it harder with the beautiful visuals to his hit single “Chukwudi”featuring Iyanya. “Chukwudi” which is one of the songs off the Timeless Album which was released some months back. The video was directed by Clarence Peters. Young obama popularly known as Niyass is a SA based rnb ,afropop singer originally from OSHOGBO state but born and brought up in Lagos state ojodu precisely. He’s a song writer.. He recorded a song titled gobe in 2011 which rocked the street of Lagos and other parts of Nigeria. He has worked with couple of acts and producers like Zee world, PJ, Dresan, Small doctor, Yq, seriki,shankorasheed, concotoins and many more. he also have some video’s with the top artists in Nigeria. Here is another single, Niyass Featuring Opasix titled `BAD GIRL produced by Tee.world concotions. The strain of Caitlyn Jenner's transition on her two youngest children became clear last night in the latest episode of Keeping Up With The Kardashians. The spotlight has only intensified on the already famous family since the 65-year-old admitted she was transgender and it seems teenager Kylie is struggling the most with the added attention. "I agree with you and I'm sorry and I think next time we will communicate better." Speaking to Kim Kardashian about the red carpet meltdown Kylie admitted she had panicked when she realised her sister wasn't there. "Kendall ditched me. She was supposed to do the interviews with me and I was like ''no, I can't do it, I'm sorry'' and I just walked off. I was looking around for Kendall and she wasn't there. I didn't know what to say." In last night's episode a distraught Kylie has an anxiety attack on the red carpet at the 2015 Billboard Music Awards, when she's faced with discussing the transition with the media. Footage shows Kylie's publicist attempting to set up interviews, but she claims she's going to "faint" and refuses to take part. "Wait, no. Now I feel too sick. I feel like I'm going to faint. I really don't want to," Kylie can be heard saying before walking off the red carpet. She had attended the award show with elders sister Kendall, but when she had other media commitments to fulfill the then 17-year-old was left alone. After the show Kylie accuses Kendall of "abandoning" her, saying: "I totally understand you had your s*** going on. I just felt like I really needed you." The model agreed she hadn't been supportive enough during the appearance. "I know that you're really independent, but I think I just have to remember that you're my little sister and I've got to protect you sometimes." "I feel like Kendall probably just assumes that you're so independent anyway. I don't think she purposely ditched you and she was there with H&M," Kim replied. "I just feel like Kendall's mostly there for me, but I really needed her this time," she added. “Peter Clarke bares it all on this track. Honest emotions ranging from frustration to anger to despair are all on display in this musical piece.